In general, I’m not a believer in cables. In my experience, they are like tone controls, so in a system where a part of the spectrum is over or under represented, a cable can make a subtle, but useful difference. However, the area where F1’s excel most, is rather surprisingly outside this category. The ability of a system to image well – that is, to provide a holographic soundstage – can often be down to the quality of the mains, cables, and isolation. Without each of these areas being sorted, the system will only be as good as the weakest link, and consequently the effect of precision space generation will be weakened or lost. Having spent a fair deal of time sorting out these issues on my review system, I was hugely impressed by what the F1’s seemed to be doing. Listening to the LSO recording of the Brahms 2nd Serenade, final movement [LSO Live], it was very clear that the F1’s were providing imaging not previously seen or heard on my system. The accuracy of the orchestra was eerily holographic, and seemed to roll out the orchestra in its front-to-back layers in a startling fashion. That’s not to say these cables are a one-trick pony, to paraphrase the colourful character on ‘The Apprentice’ a few years ago, they are a field full of ponies! The bass is really tight, precisely formed, so the attack of the double bass section is absolutely clear, and keeps time very well. I am not aware of any colouration in the mid band or top, meaning the F1’s yield an airy sound packed with detail. Moving on to a recent Tidal streamed MQA recording of the Haydn Sinfonia Concertante, Rattle and the Berlin Philharmonic, this delightfully eccentric piece brings a smile to my face as the F1 cables work their magic. The delineation between the soloists and the orchestra is beautifully portrayed, the dialogues between the two groups seem to take on a clarity which adds to the humour of the piece. The fun these musicians are having is palpable. Opera for instruments! I’m also aware of a blacker noise-free background, the cables seem to be quieter than my experience of other cables. These cables are most definitely expensive, but they come with a highly coherent concept to their design, manufactured from first principals upwards. The lack of reflection in the cables I think gives a clue to their greatest strengths, which is the ability accurately to portray lifelike 3D space in a way that I have rarely heard from a speaker cable. 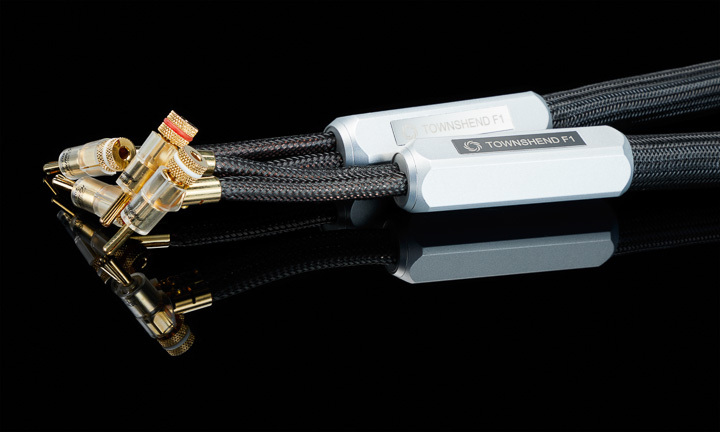 For anyone seeking to add this quality to their system, the F1 cables are required listening!